Playtime with Ciaran now includes spontaneous reading which I am absolutely thrilled about. He randomly picks a book, gestures me to come over and laughs out loud when I start reading. His favourite is “Where’s Spot” which is a no-brainer as it has flaps to uncover the missing Spot. It won’t be long before he can join me in the kitchen to whip up treats for the family. For now, it’s just me and my sturdy spatula. Quick easy recipes are what I look for these days. Our family loves oats and when I chanced upon this 5 ingredient no-bake granola bar recipe, I knew they had to be in our regular rotation. Having made them twice since, these bars have proven to be a hit. Even Ciaran can’t stay away from them. Sticky, slightly salty and with a nutty crunch, these are perfect for when you have the munchies. So idiot-proof and so delicious. I will definitely try more variations soon. Place oats, almonds and dates in a large mixing bowl – set aside. Warm honey and peanut butter in a small saucepan over low heat. Stir and pour over oat mixture and then mix, breaking up the dates to disperse throughout. Press down firmly until uniformly flattened. Cover with parchment or plastic wrap, and let firm up in fridge or freezer for 15-20 minutes. Remove bars from pan and chop into 10 even bars (or 9 squares). Store in an airtight container for up to a few days or keep in the freezer to keep them extra fresh. It does not surprise anyone when I tell them that most of my salary each month is spent on food. Others save up to buy a handbag or a pair of expensive heels, but I, I splurge on meals that excite, fascinate and please me. Whether is it dessert at my favourite patisserie, or pizza at my favourite pizzeria, when it comes to food, it isn’t hard to convince me to part with my money for a gastronomic experience. This has been the case since I earned that spending power when I left school and started working. You’d think that it’s a brilliant arrangement. And I do agree, readily. But right now, I think I have to set my priorites straight, and watch how I spend my money, especially if I am to aim for bigger things like travel. You see, I have been wanting to travel far and wide. I want to go places that I have only seen in photos and heard about from friends. There are experiences which I am dying to dive into. The desire stems from travel deprivation. My family have never travelled far. My parents have only been to Malaysia. They have never sat on a plane. As a kid, the only places I went to were across the causeway – Malacca, KL, Genting, Penang. After every long holiday in June and December, I will return to school and classmates will recount their distant travels to cool places like Disneyland in America or Japan, or Europe. I lapped these descriptions up with such eagerness, making mental notes of the places that I will go to when I am all grown up and have the means to. Recently, I went to Bali for a dear friend’s wedding. As mentioned, she has since moved to New York. That obviously warrants me to pick New York as my next destination, naturally. She’s been asking when will I visit. I had wanted to go next year but I don’t think I can wait. Sometimes, when creating goals, you need to fix the target and do whatever it takes to reach it. New York is worthy enough of such persistance. I am planning to finally pursue one of my travel dreams – to spend Christmas in New York. It will not be cheap. I know that. But I’m ready to do whatever it takes. I am willing to spend less on food. That might sound like a total abomination I know. But hey, one has to do whatever one has to do to get to their dreams and goals, no? If life has taught me something, it is this. Time waits for no one. So you ask what am I going to do? Starve? Nah, I’m too greedy to do that. I’m going to be smart about it. The answer’s very simple, really. Packed lunches. That’s going to be my saving grace. Don’t worry, I will not deprive myself of that fantastic meal once in a while. It’s just that lunch is my perfect opportunity. That’s how I am going to cut costs. As expected, I have been looking up on tasty options for my packed lunches. So these days, I usually pack whatever leftovers there were the night before (quite a regular thing because Dad always cooks so much!) or I cook before-hand. I have since found several ways to satiate my appetite in a way that doesn’t depress me. You will not find me sad eating my packed lunch. I do find it fun actually. It is also much healthier. Especially when you have full control over what seasoning and ingredients you will be using. 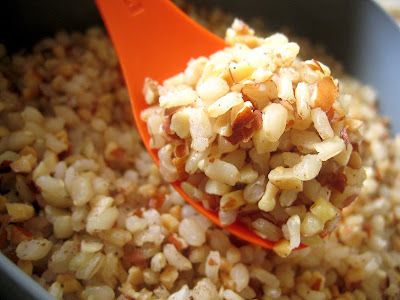 Recently, I came across a brown rice recipe that I thought was dead simple and tastes great. It’s a nutty brown rice recipe. Yes, there’s lots of nuts in it. Nuts are good and I happen to like nuts so I found it pretty amazing. They are one of the best plant sources of protein. Aren’t nuts fatty, you ask. Yes they are high in fat, but mostly monounsaturated and polyunsaturated fats. Those are good fats – omega 3, known to lower LDL cholestrol. Bottomline: it’s good for you, as long as you don’t overdose. Not only do they contain Vitamin E and selenium, but also phytonutrients and antioxidants. Plus, they are high in fibre. Are you sold yet? I hope so, because here’s the recipe below. I hope you will try it and believe me. Make sure you are not allergic to nuts though. I find that the rice is tasty enough to have on its own but please feel free to throw in random tasty bits like ham (I did that before and liked the result). Bring water to a boil in a heavy medium saucepan. Add rice and 1/4 teaspoon salt, then reduce heat to low and simmer, uncovered, until rice is tender, about 40 minutes. Drain in a sieve. Heat butter in a large heavy skillet over medium heat until foam subsides. Add nuts and cook, stirring, until butter and nuts are golden brown, about 4 minutes. Add rice and nutmeg to skillet and toss to coat.